A tiny computer worn on the human ear that can be controlled through blinking an eye or clicking the tongue is undergoing testing in Japan. The wireless device weighing 17-grams has Bluetooth capability as well as being equipped with a compass, GPS, battery, gyrosensor, microphone, speaker and barometer. Wearable computing is being considered by many as the next big technological things, with products like the Google Glass at the sector’s forefront. The computer, known currently as the Earclip-type Wearable PC also has data and microchip storage enabling its users to load software. The new system, which its developers hope will be ready by Christmas of 2015, can be connected to iPods or other types of gadgets and would allow its users to navigate through programs using just facial expressions such as sticking out the tongue, raising an eyebrow, clenching the teeth or even wiggling the nose. 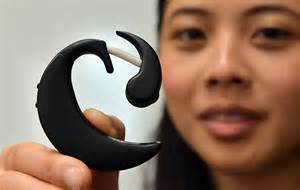 The new device uses different infrared sensors to monitor tiny movements inside the ear, which differ depending upon how the mouth and eyes move. Since the user does not need to move a hand, the computer’s developers say the PC acts as a third hand for all those including rock-climbers to caregivers, astronauts to motorbike riders, including people that have disabilities. A smartphone could be used to connect to Internet and would mean automatic contact with people in many places around the globe who are busy doing the same things you do. Developers said the ear PC could connect the user to a person looking at a star located in a remote place with some else looking at the same star and swapping impressions. Another version of the PC might be used to help family member maintain an eye on an elderly family or young children. The earpiece can also be used as a hearing aid and could monitor the health of the wearer, including reading their body temperature and pulse, while logging how frequently they sneeze and eat, which offers an early warning to a possible illness. An accelerometer on the PC could tell when a user falls then instruct a smartphone to pass along that information to relatives or to dial directly an ambulance, based upon the data from the GPS.